UNIZEO project published a user manual that explains farmers what Urelite does and how to use the product. Moreover, most of the project's technical deliverables have now been published on this website, see under materials on the left sidebar of this page. On March 27, 2015 at the theater of the Salesian Schools of Lombriasco (TO) it was held the final conference of the Project UNIZEO (LIFE10 ENV / IT / 347). The activities carried out in these three and a half years of work were presented to the numerous participants: about 60 participants representing farms, institutional bodies, associations and students. On March 27, 2015 at the Salesian Schools of Lombriasco (Turin) will be presented the final conference of the Project UNIZEO. In the coming days it will be published on this website the event poster. The activity was carried out as planned; the farms involved in the first year of experimentation have agreed to confirm to the second year of activity. The results of the previous year have been confirmed with the addition of a further positive aspect for the nitrogen balance: the nitrogen surplus in the second year were in general lower with Urelite compared with control and this can give a positive effect in relation to the risk of nitrates leaching. Also the content of nitrogen in the soil, at the end of the crop cycle, were lower in the plots fertilized with Urelite compared with control treatment. The report will be published soon and it will be organized in March (date to be defined) the final conference of the project. Department of Chemistry and Geology - University of Modena and Reggio Emilia. The project Unizeo participated in the workshop organized by colleagues of the LIFE ZEOLife project exposing the results obtained after the first year of activity. Simone Salvetti (Minerali Industriali Srl) described the project in general, Gianni Marchello was responsible to present the technical characteristic of the new fertilizer Ureilite and Carlo Odore (Medilabor) summarized the field results obtained in the first year of activity. First year of activity on lands. Representative photos of the various phases: from the new fertilizer application on lands to the harvest. We are finalizing the activities of the new fertilizer application on the lands involved in the second year of trial, according to the scheduled program. Soon, a report with the results of the first year of activity will be published on this web site. On 29 May, the internal monitor of the EC carried out a monitoring visit to the project Unizeo. Two parcels of land in which the tests have been conducted using the new fertilizer, respectively Lombriasco (TO) for corn and Faule (CN) for wheat, have been shown. The visit continued in Carmagnola with a projection of the results achieved in the first year of monitoring activities on the fields and it ended with an overview of project status with technical / financial checks. The Unizeo Life+ Project at the Open-day for ‘seeds producing Companies’ held on 28th at Podere Pignatelli Institute with exposure of notice boards. 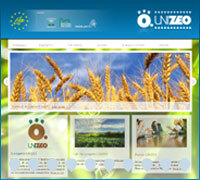 From January 2012 the Project Life+ Unizeo “Urea-based nitrogenous fertilizers coated with zeolite: reducing drastically pollution due to nitrogen” website is on-line. On the website it can be found all the details of the project including reports and updates.